Working in the world of Interiors over the last few years, and doing research for this blog has opened my eyes to the fact that these days, you can pretty much buy anything you could think of. Any crazy idea you have, just a few hours on the internet and you’ve probably found it – or someone who could find/make it for you. It gets quite overwhelming when you’re doing your own home up… So many ideas, but what really is it that you want to end up living with? Nevermind the fact it was an absolute bargain – ex display with a massive discount from John Lewis – I love the shape and the presence it has on the wall. A sneak peek into the exciting life I live; when we’re sat in the living room, we often have the door open and from where I usually sit on “My Sofa”, if I look to my left, I can see so many different reflections from all the facets of the frame part of the mirror. It’s a really unique view, where I can see from the front door on one side, and through into the dining room on the other! I knew I didn’t want the standard rectangle or circular mirror, so I found this. And it seems a weird thing to say, but I definitely think that hexagons are my favourite shape when it comes to interesting interior decorative accessories or feature pieces of furniture. 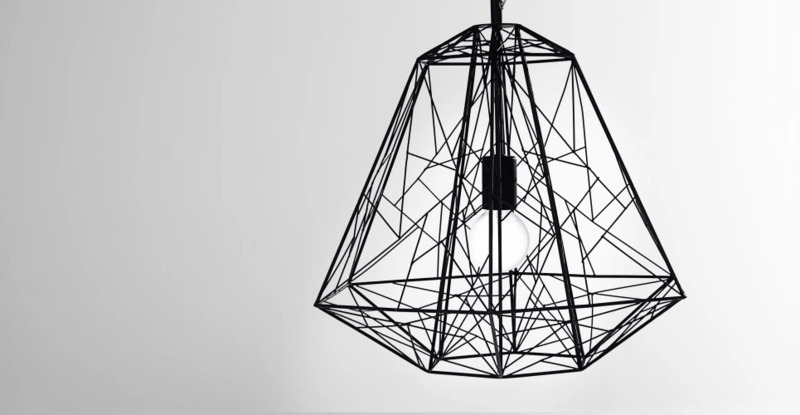 Hive pendant light, Black, £99, Made. I really like the industrial feel of this pendant light. I think it would look great over a desk in a home office or it could cast some amazing shadows if used in a narrow (but high ceiling-ed) hallway. Wood Honeycomb Shelf, £35, Urban Outfitters. I think this is a really neat idea. A single one above your desk for stationary, or above your dressing table for pretty bits and bobs, or a group of three of these offset in a recess to store books. Eye catching and practical – what more could you want?! I am so in love with these! 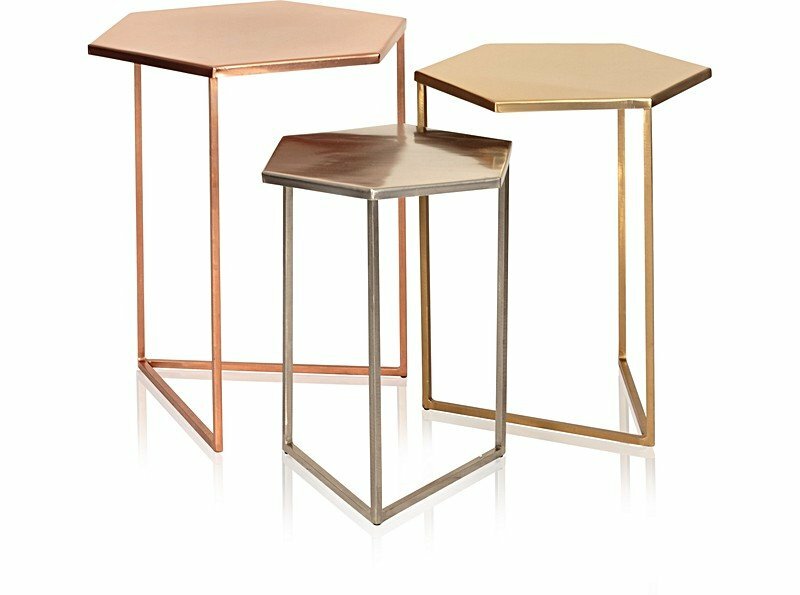 Made of iron, these tables in Gold, Silver and Copper finishes would easily sit with really any colour scheme. With a white backdrop with neon notes, these tables could add a Miami beach summer house vibe. With dark, rich, colours like teal or a deep purple they would finish off a very Hotel chic style scheme. Geometric Cube Decor Dove/Smoke/White tiles, £96/m² Mandarin Stone. These tiles are fab; the hexagonal shape, paired with the geometric 3D effect is so interesting. They have got quite a natural textured finish, so would look great as a deep kitchen splashback against a smooth white quartz worktop. Hexagonal Mirror, £95, Dunelm Mill. Couldn’t believe my eyes when I spotted this gem in Dunelm Mill – not usually a place I would associate with such interesting design. Sometimes too many hexagons can get a bit honeycomb-esque and unless you’re going for a bee-themed interior, it can look a bit odd. The way this mirror offsets the depths and placement of the hexagons keeps it looking fresh. Contemporary or classic style, this will suit. Gorgeous. Supersize Aztec Hexagon Terranium, from £155, The Urban Botanist. These are great and come in a couple of sizes so you could make an amazing display. So good if you live in an apartment or have no outside space, you can make your own indoor garden feature! What do you think? Am I the only one with a favourite shape for these types of things?! What’s yours? This entry was posted in Inspiration and tagged hexagons, humour, indoor garden, Inspiration, interior design, lighting, metallics, mirrors, reflections, tiles. Bookmark the permalink.